Combine all the dough ingredients in the bowl of a stand mixer, and mix with the paddle attachment until somewhat combined (or just mix by hand with a wooden spoon). Change to the dough hook and knead on medium low for 5 minutes. The dough should feel soft and smooth, not sticky to the touch. Lightly dust the dough with flour, then place in a ziploc bag and let the dough rise for 30 minutes. Remove the dough from the bag and place onto a lightly oiled countertop. Divide the dough into 8 pieces (just cut it with a knife). Bake for 9 to 10 minutes until the pretzels are golden brown. Brush the pretzels with the melted butter while they are hot out of the oven, so the bread can soak up all the buttery goodness. Mmm. Enjoy while they are hot, and keep in mind these don’t taste as amazing the next day. So this pretty much means that you’re allowed to eat all of them now =) Enjoy! 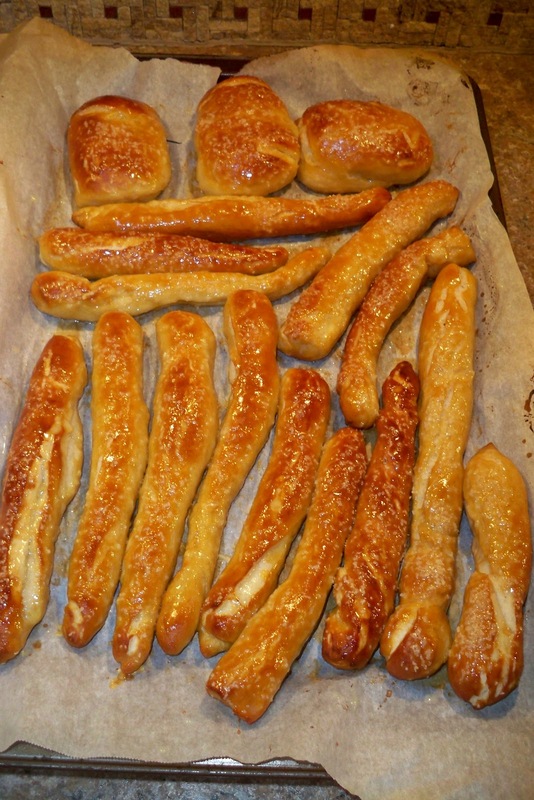 Recipe adapted from Glenda’s Hot Buttered Pretzels who adapted from King Arthur Flour.